While you’re sipping your morning coffee and reading the paper, Christopher and Jenny Gray are probably already out on their property along with pickers, harvesting their asparagus crop – those green spears of deliciousness that we wait all winter for. The asparagus is sold at farmers’ markets in Lincoln, Lyttleton Rudolf Steiner School grounds, Ombersley Terrace Opawa, and of course at the farm gate – 1905 SH75 (the Christchurch to Akaroa Road). 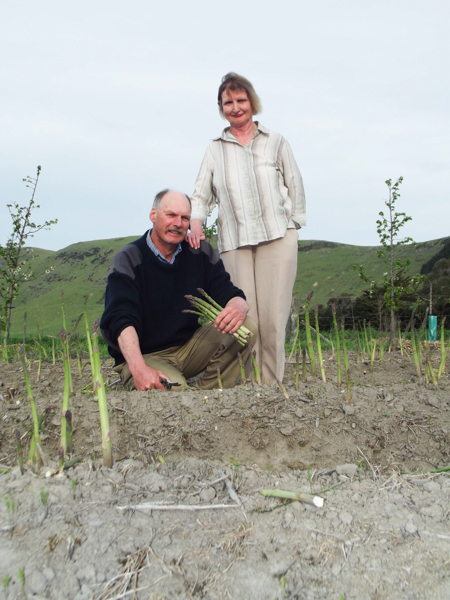 In addition, you can find the Grays’ asparagus on the menu at several top Canterbury restaurants, including the award-winning Roots in Lyttelton. While tender, slim asparagus spears are traditionally sought after, Jenny says some people prefer the wider ﬂeshier tips instead.